Hernando County, a designated Purple Heart County, proudly unveiled its first sign to remember those injured in combat. 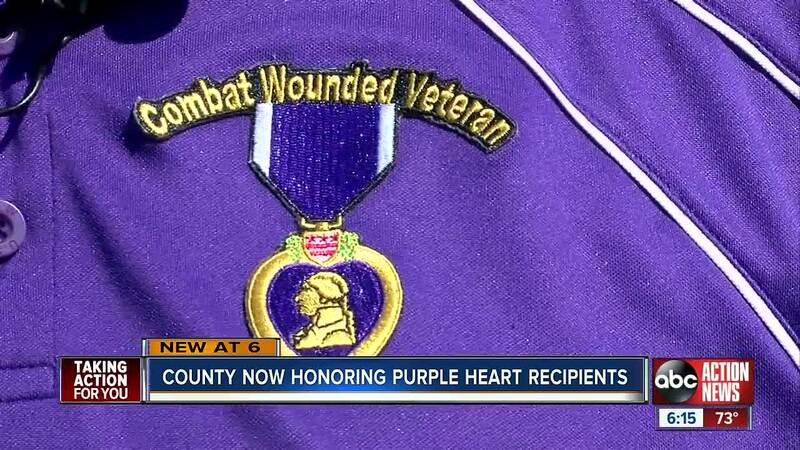 HERNANDO COUNTY, Fla. — Hernando County, a designated Purple Heart County, proudly unveiled its first sign to remember those injured in combat. Signs tell us where we’re going, and where we’ve been. But this new sign tells us to never forget. "These were people who left their blood on foreign soil," said Steve Tyler, a U.S. Army Veteran. Hernando County became the 65th Florida municipality to be designated as a Purple Heart County on Nov. 7, 2017. "A lot of people think that it’s an award. It's not an award. You’re a recipient. Its something that’s given to you because of things that have occurred," said Dale Fair, a Purple Heart Recipient who lives in Spring Hill. For Fair, it occurred on April 6, 2008 while serving in Iraq. "It was a bad day. I lost two great soldiers in my group and one was a great friend. Me, I got out alive," said Fair. Fair was wounded and received A Purple Heart. "We’re in a select group and none of really wanted to be there, but unfortunately we are so we carry on and make the country aware of who we are and what we are," said Richard Allen, Purple Heart recipient. Hernando was the 65th Florida municipality to be designated as a Purple Heart County. On Wednesday a sign was unveiled on the corner of Mariner Boulevard and County Line Road in Spring Hill. Just one of eight signs that will be installed throughout the county. "This means something to guys like me because it lets us feel that, hey, we aren’t forgotten," said Fair.